Ida Blankenship died on Sunday. At her desk at the advertising agency Sterling Cooper Draper Pryce. She will be remembered as Don Draper’s secretary. As one her colleagues put, it "She died as she lived–surrounded by the people she answered phones for." The good news is that Ida is a fictional character. Her death was therefore a fictional event. No mourning is called for. 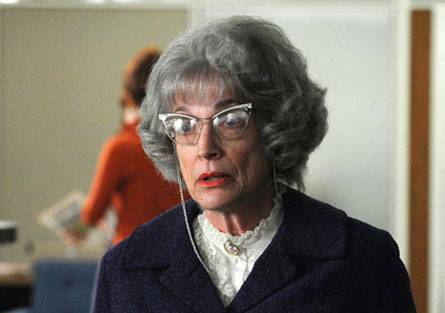 Unless of course you had grown to love her contribution to Mad Men, as many of us had. That Ida is a fictional character didn’t stop the Daily Beast from running a eulogy for her. Which is pretty charming. I think. For starters, it plays out the Mad Men fiction. It pretends Ida Blankenship were the real thing. It’s a small act of cocreation. But it’s more than cocreation. It’s witty. It attributes the honor given real humans to a pretend human. "Ah," we think, "clever." We may also think of the Ida eulogy as simple play. It’s a little "what if." As in, "what if we treated Ida is if she were a real person." As in, "let’s act as if Roger isn’t a dog." And this gets us a little closer to the mechanics of the transposition. This movement of meanings is successful when it fails. If we attribute something to Roger that does work, "Roger is a good doggie woggie" for instance, it’s like "so?" It’s only when we say Roger is a) thinking , b) about an advanced degree, that we begin to get somewhere humor wise. This cultural act is designed to make a small buzzer sound in our brain. It designed to forces us to say "that doesn’t go there. Roger is a dog." It’s only when we think of Roger otherwise that it’s drole (drool?). I’m surprised. Apparently, we don’t mind it when meanings are reassigned. Apparently, we actually quite like when culture is corrupted. (Well, not stupid people. Stupid people get confused and then they blame the rest of us for their confusion.) But the rest of the world, and that’s most of the world, love this kind of play. Maybe this is just the kind of thing that bothers an anthropologist. (It is after all only linguists who do not groan at puns. They just fall into a reverential silence.) I guess when you spend your life looking at how we build culture up, there is something astonishing at looking at the pleasure we take when someone ever so briefly tears it down. It could also be that I am writing this at 31,000 feet courtesy of American Airlines and Go Go In Flight. It’s the oxygen debt talking. But it is weird. No? Just me? Ok, it’s just me. To Pam DeCesare for giving me the head’s up on the Daily Beast article. To Randee Heller, the very gifted actress who helped invent Ida. Anonymous. 2010. A Eulogy for Don Draper’s secretary. The Daily Beast. Sapir, J. David, and Jon Christopher Crocker, editors. 1977. The Social use of metaphor: essays on the anthropology of rhetoric. Philadelphia: University of Pennsylvania Press. This entry was posted in Uncategorized and tagged Christopher Crocker, David Sapir, humor, Ida Blankenship, Mad Men, meaning, meaning movement, Pam DeCesare, Randee Heller, The Daily Beast, The Social Use of Metaphor, wit on September 22, 2010 by Grant. no altitude sickness here. ida is, as you say, something of a marvel on mad men and her death, even moreso. what felt smart about her was her providing a history to the ad business that preceded sterling cooper. she was useful in re-imagining bert cooper and (maybe) avoiding a feeling of mad men being a bit frozen in time – or at least only moving forward, towards us through the familiar historical terrain we get so excited to see. she gave them a past, which emboldens their efforts, i think. the to the playfulness of our current moment – i think most of our creativity (to borrow from a friend) these days are a kind of aesthetic revolution. moving, reassigning, shuffling, toying, etc. if we are in fact becoming aspy – or at least developing an embittered relationship with order – then we must respond with the remix, the pun, the meme wars – it’s the only battlefield left. I loved what Peter Spear said about Ida re-imaging Mad Men by giving them a past. The mid century modern aesthetic and the just on the brink of revolution feeling that is captured by the series is immaculate, and then comes Ida to ground it all. She, more poignantly than Bert Cooper, seems to put Draper in his place in the cultural continuum of the show. For me, I can’t stop thinking that she is Laverne’s mom, never seen on the Laverne and Shirley show set in the 1950’s… so it would work just fine.